The beauty in any one CocoRosie song is abundant and it's often tantalizingly awkward, something that's a bit of a reach, though, it's always there and will make itself visible however it wants and whenever it wants. Sierra and Bianca Casady make sure that their songs are labyrinths of bizarre interludes and odd wall-hangings, decorations that all feed into the strangeness of their music. That strangeness, however, should not be taken as silly or flimsy, as anything other than two minds working their ways out of their own squiggles and creeping vines and doing so through such fantastical imagery that allows the Casady sisters to act out their stories as moon gypsies, living as hippies and riddles. The beauty in any one CocoRosie song finds you either capable of taking it in - cupping it shivering inside your hands - or looking at it sideways and wondering what it is exactly you're seeing, what exactly it is you're hearing. It takes you a second to arrive at any kind of familiarity and even that sometimes never happens and you just love its deformities and characteristics paternally or maternally - stroking their hair and caressing their interesting cheeks. Some of the songs on the group's newest album, "Grey Oceans," sound as if they're coming from the beaks of ravens perched on the branches of trees in a dead, desolate forest, looking down and commenting on the things that happen when people are pushed into a corner. They are witchy tunes that incorporate all kinds of spookiness into the weirdo folk, operatic, beat-tastic orchestrations that always sound as if those characters involved in the lyrics are just moments away from biting into a poisonous apple and being put under a spell that will keep them asleep for one hundred years. We feel as if none of the people on "Grey Oceans" are safe, none of them have anything figured out just yet, but they're racing through the woods with a purpose, passing the graveyards and calling up fleeting feelings of disaster as they try to remember what it was like to grow up, when being a child suddenly didn't feel like being a child any long. It's that boundary between all of the heaviness of growing up and into an adult life and fighting that natural evolution. It's keeping both feet still in footie pajamas and dolls, while coming to grips with being a woman. It's a startling conclusion and one that seems to take the subjects of these songs some time to understand. There are familial issues and other aspects of forced childhood that come to light on "Grey Oceans," and even more so in the new song, "Fatherhood," recorded and featured here for the first time. It starts with a rooster crowing and a dark piano strum and then travels into a realm that sounds like "The Milk-Eyed Mender," a My Brightest Diamond's brilliance and a menagerie of beasts, demons, werewolves, spirits, ghosts and wolves turning out a smoky chorus. We take all of this to have something to do with giving life and never being able to successfully guarantee that you will be able to protect those lives that you made with a messy little act and that's about as frightening as anything comes. 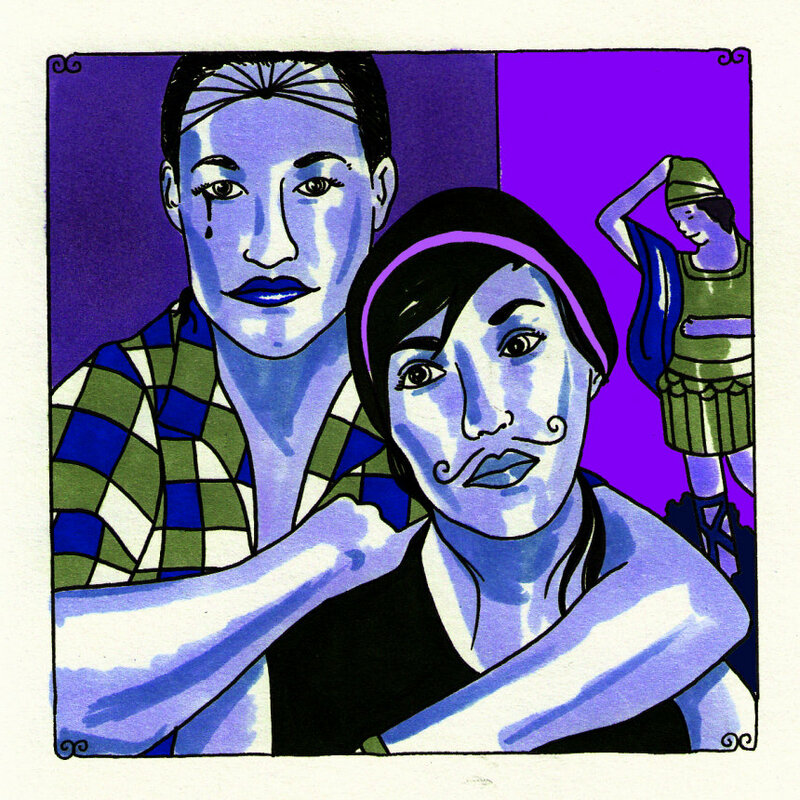 They sing, "Magic doesn't save your kids," and maybe because nothing's safe and nothing's sacred, we hear CocoRosie as that gorgeous lightening, striking as a reminder, making us cover up and whisper through the night.